To order, please contact me by email (preferred) or telephone so that I can get all the necessary information and answer any questions. Shipping charges to US addresses are listed below. Estimated international shipping charges or sales tax (8.7% for WA state residents only) will be provided upon request. For US orders only, PayPal, credit card over the phone (including Debit), personal check, bank check or US Postal Service Money Order is fine. Please make checks payable to Casey Burns. For International orders including Canada, PayPal, credit card over the phone (including Debit), or International Money Order only. I ship via insured Priority mail via Endicia mail for all shipping including International destinations. Instruments are insured and declared at full value. International orders over $2500 will be shipped in two separate packages. For All International Orders, please send me a contact phone or cell phone number! If I happen to have instruments available or close to finish that meet your needs, a full payment including postage will be requested. Otherwise, a nonrefundable 25% deposit will be requested, with the balance including shipping and sales tax, if applicable, due before completion. I usually request the balance around the beginning of the month in which I expect to complete your flute. Flute and Option prices do not include postage and insurance, those charges are estimated below for US addresses. The delivery times I quote to you are commonly subject to change, due to unforeseen events, etc. By placing your order, you agree to my terms and policies stated here. All sales are final. However, if you find that the instrument has a few minor points that need tweaking, such as for hand position, I are happy to work with you until the flute meets your satisfaction. This service, however, must be refit into the queue and can add much additional time until completion, as I don't always have wood ready for this, or the time in my queue. You will also pay any extra shipping charges involved. Your 25% nonrefundable deposit is taken as an your commitment to purchase an instrument. In the unlikely circumstance that you have to cancel your order, your deposit will be forfeited. I usually request the balance due near the start of the month in which I expect to finish your instrument. Please allow me time to complete your instrument! Checking up on your instrument's progress, especially long before it is promised, requires much time and energy that could be better put towards flutemaking, and does nothing to hurry your flute's progress to completion! At best, delivery estimates are a rough approximation. I will notify you when your flute is approaching completion. The prices on my web pages are current. Sometimes a few years will go by before I do any web page editing. If the website works - then why change it? My prices are likely to stay at the current levels unless the economy changes and the dollar drops. (May 17, 2015). Instruments are guaranteed against defects of workmanship for one year. You are responsible to follow the Care Instructions and ensure that the instrument is not subjected to sudden or extreme shifts in temperature or relative humidity, such as playing a cold instrument without allowing it to come to room temperature by itself. You need to oil it every 10 hours of playing time with commercial bore oil. Failure to carefully follow the Care Instructions, including a proper break-in period, will void the warranty. Those in dry states such as Colorado are encouraged to carefully follow the care instructions to the letter! Cracking or checking of the wood is sometimes a problem with woodwinds. Cracking goes all the way to the bore and is very rare, whereas checking is on the surface (similar to a crevasse on a glacier). I carefully choose pieces that are crack or check free, and inspect each piece microscopically between the various stages of the manufacturing process to make sure that the wood does not have this flaw. Unfortunately, these flaws (usually checks) sometimes show up after the final oiling of the flute, causing a delay in the shipping of the instrument as I replace the offending part. I take further steps to protect the wood such as sealing the end grain and am considering sealing up my flutes entirely (I do this as a rule for ones headed to dry climates). What makes it out of the shop usually has a high success rate. However, cracks and checks might appear later on, especially if one neglects proper storage and care, as is usually the case. I see evidence of this in most of the flutes that come back for this repair. Most have never been properly oiled by the end user, or properly protected from extreme dryness. In the past I have replaced cracked or checked parts without question. But given the difficulty of obtaining good wood and getting it ready to use, I can no longer do this. Thus I have revised my policy on this. If bad cracks or checks appear within a few months after receipt, I will usually replace the offending part, unless the checking is minor and is little more than a cosmetic flaw which can be easily repaired. Beyond that point, I will be happy to repair cracks and checks without replacing the wood, or recommend that you take it to a local woodwind specialist for repair, if I am too busy to do this. In all cases you will have to pay any shipping charges and wait for me to have time to get to it. Tweaking and Adjustments: I manufacture my flutes to pitch, voicing and internal tuning standards that I have iteratively developed over the years. This works for the majority of my clients, who find these flutes well suited for their playing styles. No two flute players are alike however. It is not uncommon to find a player who will blow a flute sharp for instance, or who will find the internal tuning inconsistent. My desire is to provide a flute that merits 100% satisfaction. I therefore am more than happy to make the necessary adjustments to correct and balance a flute for an individual's playing idiosyncracies. In many cases I have provided a selection of flutes to sample, before a final selection was made. However, the time demands of my waiting list require that I abandon this approach, except when absolutely necessary and justified. Thus if you are a seasoned player or performer looking for that "right" flute, this approach might be followed. For everyone else, please trust your maker's judgement! Pricing for all models is the same, varying in price only for the key and tuning slide options listed below. Note that I have raised my Domestic (US) shipping prices listed below. International postal rates can range from $35 to $140 depending upon what is ordered, and the shipping method. Domestic (US) orders are insured at full value. I can now only insure international orders up to $2500 per package maximum - thus for an expensive instrument significantly above this price, I have to send the flute in sections in two separately insured packages. 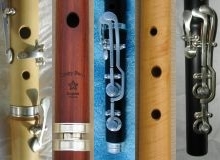 For pricing on the Folk Flute, please see the Folk Flute page. All flutes come with a cloth case. Keyless and one or two keyed flutes come with a 3 section velcro closed "pouch" type case. Multi-keyed flutes come with a zippered 3 section case similar to a standard flute case, but soft padded to protect the keywork. Please note that prices, especially for instruments with Sterling Silver (those with rings, tuning slide, or keys), are subject to change without notice, due to the volatility of silver prices. International shipping will be estimated at the time the flute nears completion. I never have any flutes in stock. Flutes are usually made to order. In general, keyless flutes including low flutes can be available within 2-4 months, depending upon the size of my queue, including my Folk Flute queue. Keyed flutes take a bit longer, but at the most only 3-6 months depending upon my backlog. Mopane flutes take longer than 2-4 months as the wood I have on hand requires some time in between turning steps to be fully ready. Thus order in blackwood or boxwood for the quickest delivery. Usually Folk Flutes are shipped within 60 days or less from day of ordering. For current Folk Flute delivery times, please visit the Folk Flute page (updated May 17, 2015).